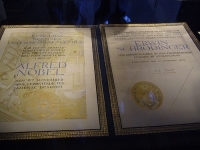 Taking place each year at the Stockholm Concert Hall, the King presents the Nobel Prize for medicine, literature, physics, chemistry, and economics. The lavish Nobel Prize Banquet follows at the City Hall. The award winners are announced in October and the presentation takes place on the anniversary of Nobel's death. Each recipient of the award presents a lecture in the days prior to the award ceremony. The event attracts many world leaders and other famous people, so security inevitably tightens up around the official venues in Stockholm. Some delays at airports and general traffic means disruptions are anticipated. Venue: Stockholm Concert Hall, Hötorget 8, Stockholm, Sweden.